Raaga.com: Bollywood’s most eligible bachelor Shahid Kapoor Weds! Bollywood’s most eligible bachelor Shahid Kapoor Weds! 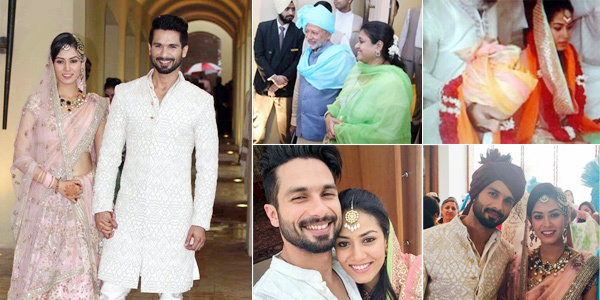 The most eligible bachelor of Bollywood HYDER actor Shahid Kapoor got married to the Delhi-based Mira Rajput in the traditional Punjabi Style on Tuesday July 7, 2015. The marriage was solely a close knit family affair that was attended by about 40 guests within the family, minus any celebrity from Bollywood. The couple Shahid Kapoor, 34 and Mira Rajput, 21, was dressed in the typical conventional Punjabi outfits and looked bewitching. Shahid wore a cream color sherwani designed by Kunal Rawal. The yellow safa (turban) on his head gave him a real imperial look. On the other hand, Mira wore light pink and silver embroidered lehenga with a veil over her head designed by Anamika Khanna. What added to the splendor of Mira’s beauty was an elaborate Navratna neckpiece and earrings set. In addition the ‘maang-tika’ and a ‘jhoomar’ on the side of her head made her look a characteristic Indian bride. After the wedding rituals the newly wedded couple came outside the Gurudwara hand-in-hand and posed for a few minutes for the paparazzi desperately seeking their couple’s pictures. Addressing the media Shahid Kapoor said, “Thank you,” and drove away. Those spotted included Shahid's dad Pankaj Kapur, step-mother Supriya Pathak, and step-siblings Sanaah and Ruhaan. Surprisingly Shahid Kapoor’s biological mother Neelima Azeem was not spotted!! Though Neelima Azeem was present at the sangeet ceremony held on Monday night. After the wedding ritual a lavish party was arranged at The Oberoi in Gurgaon in the evening. The ballroom was booked for 500-odd guests; all invitees were mostly family memebers, some friends and members of the Radha Soami Satsang to which both families belong. A star studded reception is apparently scheduled in Mumbai for July 12.